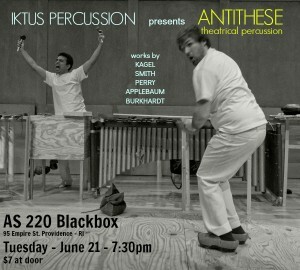 Antithese is a program of humorous and dramatic works for music-theatre focusing mainly on works that bring emphasis to the theatrical aspects of percussion performance. This project features the nonsensical absurdity and the instigating ingenuity of works by composers Mauricio Kagel, Vinko Globokar, Rick Burkhardt, Stuart Saunders Smith, and Mark Applebaum. Based in New York City, Iktus Percussion is an ambitious, collective-based operation committed to expanding the boundaries of the percussion genre featuring an array of industrious and multi-talented percussionists. With an exciting and diverse repertoire, Iktus has performed at such venues and festivals as the Bang on A Can Marathon, Galapagos Arts Space, Le Poisson Rouge, Roulette, Issue Project Room, National Sawdust, Symphony Space, The Tank, and Trinity Church. Iktus was selected as a Time Out New York Critic’s Pick: Top Ten Concert of the Year in 2010 and received critical acclaim from the New York Times their performance with the St. Petersburg Chamber Symphony.